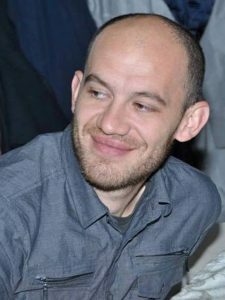 Zhivko Grozdanoski, born on November 10 th 1986, had lived most of his life in his home in the village of Bigor Dolenci, in Western Republic of Macedonia. He has studied in an American high school in Skopje, and аt the University of philology in Skopje (Italian language and literature). He has translated from Italian three books of prose (Svevo, Ammaniti, Trevi), an essay (Baricco) and a book of poetry (Montale); he has published four books (one book of poetry, two books of short stories, one novel), and in 2006 he has presented his short amateur documentary in the critics’ week on the Cannes Film Festival. He has worked in a freight forwarding company, Italian cultural center, restaurants, a plastic injection molding plant, and a civil engineering company – Zhivko’s last work of literature, the novel “The last of all the Future’s names” deals also with the construction of a tunnel in southern Bosnia and Herzegovina.